Is your unruly stomach keeping you up at night? How about some Trojan condoms to help you get some rest… You say that doesn’t make a lick of sense? Welcome to the wonderful world of Target’s inane suggested substitutions. We’ve been writing about Target’s bizarre substitution suggestions for years, whether it’s telling customers that an elephant-shaped humidifier is a replacement for nicotine patches; or a flash drive is just as good as that flash bulb you were looking for; or to just go buy a mirror instead of a scale. 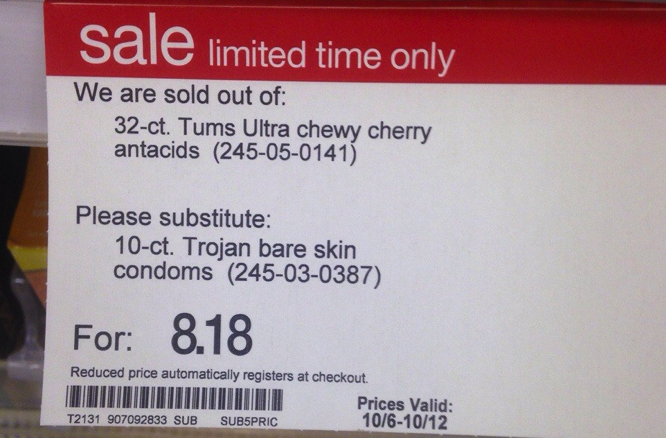 The newest one, posted on Reddit, suggests that since the store is out of Tums Chewy Cherry Antacid, don’t go and buy another chewable antacid. No, pick up a 10-pack of Trojan condoms instead. I will pretty much sub the first thing I see that is in the +/- $1 price range of the item. Because lazy. Also, you cannot sub an item that is a promotional item, and that’s usually all of the actually substitutable items. So if that particular size of tums are on sale, chances are most of the antacids within a similar range of price are also on sale.